PRESS “SUBSCRIBE” (IF YOU’RE NOT SUBSCRIBED TO OUR YOUTUBE CHANNEL ALREADY) AND THEN PRESS THE BELL. In 2018, Reel News went on a 14 week tour of North America to look at grassroots struggles around climate change, particularly struggles around a “just transition” from fossil fuels to renewable energy, where workers and communities control the process so that they benefit from the transition, and around “just recovery” – recovery from extreme weather events which do not exascerbate current inequalities. What we found were inspiring and visionary struggles all over the continent, led by working class communities of colour, with people organising just transitions and just recoveries themselves. Now, we’ll be presenting what we found in the form of a weekly online 11 episode series starting on Sunday April 14th – 7pm UK time, 3pm New York City time, Midday California time. Episode 1 is about Alberta, Canada, where the long oil sands boom has come to an end. Falling oil prices are leading to thousands of job losses – which has started a serious conversation in the labour movement about transitioning away from oil to renewables. The need is becoming more urgent as the big oil sands companies look to maximise profits and slash even more jobs through automation. This film looks at a number of initiatives, the history of oppression of First Nations people to get the resources in the first place, and a rare chance to hear from oil sands workers themselves, including women and First Nations workers. With the current growing uprising over climate change giving renewed hope, we’re hoping that this will not only inspire you further – but will also help a little in putting the idea of just transition at the forefront of the movement. Please add your name, below, in support of our response to the draft North London Waste Plan (NLWP). We’re calling for Pinkham Way to be removed. This submission is the culmination of 8 years of work and your activism. It documents in detail the disgraceful disregard that’s been shown for evidence and planning process, and for us as residents. The councils and waste authority ignore our evidenced arguments, but soon we’ll have the attention of an independent Planning Inspector. Make sure all you’ve done so far is followed through with maximum impact. Add your name, and, if you haven’t already, please help us pay for professional consultants. Please sign by midnight on Wednesday 10 April. Every adult (18+) in your household can sign individually. Your name will count as your submission to the NLWP; please do not make any additional individual submission. You can read an overview of our submission to the NLWP. Barnet Co-operative Party is hosting a talk by community energy specialist Dr Afsheen Rashid. Afsheen is the CEO of Repowering London . A former Senior Policy Advisor at the Department of Energy and Climate Change and current Chair of Community Energy England, Afsheen is a leading figure in the field of community energy generation and was awarded an MBE in the 2016 New Year’s Honours List for her work in renewable energy in deprived London communities. In her talk, Dr Raschid will talk about the community-owned solar energy project on the Banister House Estate in Hackney. Banister House Solar is the first community owned solar energy project in Hackney as well as the UK’s largest community energy project on social housing. Hackney Council commissioned Repowering London to develop this project in January 2014. Repowering London has worked to develop this project alongside residents of the Banister House Estate and local energy advocacy group Hackney Energy. The project development has been funded and supported by Hackney Council. On the 3rd of October 2015 Banister House Solar went live, generating renewable, community-owned electricity for the Banister House Estate and its residents. The co-operative was established with 4 local directors from Banister House Estate. 25 local young people were engaged in the 30 week paid internship programme. 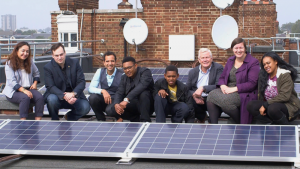 6 local young people benefitted from paid work experience installing solar panels on their estate. In total 102 kWp of solar array has been installed on the estate. Over the project’s 20-year lifetime, 679 tonnes of CO2 will be prevented from entering the atmosphere. Since it went live, Banister House Solar has generated 92,385 kWh of clean renewable electricity (November 2016). This is roughly equivalent to the electricity usage of 38 average Banister flats for a full year. This means that Banister House Solar has saved around 42 tonnes of C02 from entering the atmosphere since its launch. The recent IPCC report is a landmark for our planet, setting out just what is at stake if we breach 1.5C warming. For many years 2C was talked of as a ‘safe’ limit. It was only by the tireless work of those countries most at risk from climate change that 1.5C made it into the Paris agreement at all. But now it is clear that 2C is ‘safe’ for no one. It’s also clear that we’re on track to overshoot it. Nations’ inadequate plans to tackle climate change would see us reaching 3C or 4C within the lifetime of today’s children. Heatwaves and hurricanes make it clear: it’s time to act on climate change. The Paris agreement was a starting point but we have a long way to go, and it’s not just Trump who won’t quit fossil fuels. From fracking to a Heathrow third runway, the UK is stalling on climate action. This December in Poland, countries will negotiate the crucial next steps to keep the Paris climate deal on the rails. It’s urgent. But we know we can’t depend on governments to represent us at UN talks infiltrated by fossil fuel interests. We need to hear the voices of those in the front line of climate change, those whose land and water is threatened by fossil fuel industry pollution, and those fighting for climate jobs. 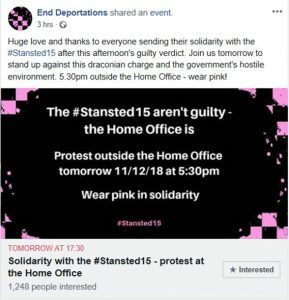 We need solidarity from all parts of society, as we saw in the unprecedented mobilisation against Trump’s UK visit this summer. The government of Poland wants to suppress the voice of civil society, but we will speak out and send a clear message to our own government to act on climate now. Assemble from 12pm near the Polish Embassy on Portland Place. 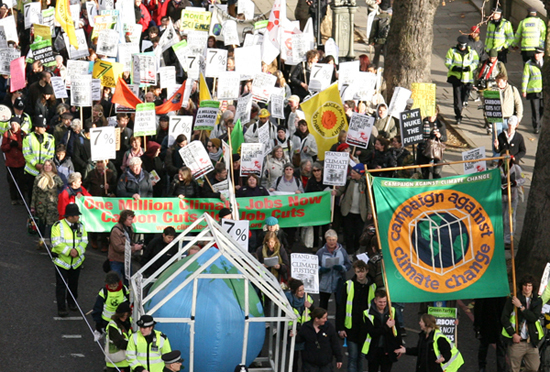 March to Downing Street, where the Frack Free United open letter / declaration against fracking will be handed in. Trident’s replacement will cost at least £205 billion of public money. A staggering figure, particularly when we consider the nuclear weapons system has no real military value and is useless in the face of the real threats we face today, such as terrorism, climate change and cyber-attacks and could be rendered obsolete by new technology. But many try to argue that this investment is worth it because of the jobs the nuclear weapon system sustains. People’s livelihoods matter. But an objective appraisal of the jobs associated with Trident, Britain’s nuclear weapons system, and its replacement will demonstrate that these are among the most costly jobs ever created. By simply re-directing a proportion of the money allocated to the Trident replacement programme to other industries, it would be possible to create many more, highly specialised and well-paid jobs. This transition programme would directly benefit those currently working on Britain’s nuclear weapons. Society as a whole would benefit from the shift to more productive jobs. And of course, humanity as a whole would benefit from the reduction in the numbers of weapons of mass destruction. Fracking worsens Climate Change: ‘Fracking’ is the extraction of natural gas (or oil) by injecting fluid at high pressure to fracture rock. Like all fossil fuels, this gas produces carbon dioxide (CO2) when burnt. CO2 is the single biggest contributing gas to global warming, which is threatening catastrophic climate change. Fracking has been suggested as a ‘cleaner’ alternative to coal, but recent studies on methane gas leaking from wells contradict this. Methane is an even more potent greenhouse gas than CO2. Fracking won’t create large numbers of permanent jobs: The jobs are likely to be short‑term specialised jobs, filled by existing staff already employed by the company rather than local jobs.Numbers are also over‑hyped. A report from Friends of the Earth, supported by the PCS trade union and North West trades councils, argued that a claim by gas company Cuadrilla that fracking would bring 1,700 jobs to the area was misleading as most would last for just one year. Fracking could lead to job losses in agriculture and tourism. Alternative energy strategies create more and longer lasting jobs: The Friends of the Earth report concluded “Renewable energy and energy efficiency… create over six times as many jobs as gas per unit of power generated or saved and around three times as many jobs for the same amount invested.”. Fracking will have a major impact on communities: A planning application for one well in North Yorkshire said drilling would create over 1,400 vehicle trips. This is disruptive, polluting and dangerous. Other impacts include an increase in earthquake risk, the disfiguring of local landscapes and reduced value of houses. The rich might be able to move, but it is much harder for workers and the poor to escape. Fracking can damage health: Fracking has been accompanied by claims of extensive local pollution to air, land and water sources. New York’s government banned fracking because it concluded fracking posed too great a risk to health. Over 500 academic papers warn of the risk to health from fracking. communities around the world.The One Million Climate Jobs report proposes a ‘National Climate Service’ to create public‑sector jobs in industries that reduce carbon emissions. Seven national trade unions and many union branches have signed up to this as an alternative that can create decent, well paid, safe jobs that tackle environmental destruction. Fracking is opposed by the NUT, PCS, BFAWU, EIS, TSSA and UCU unions. Fracking has been banned in Scotland, Ireland, Bulgaria and France and there are moratoriums in many other places including Wales, Netherlands and Germany. Trade unionists have joined environmental activists and residents to oppose fracking because working class people should not be forced to work in the dirty, dangerous and unsustainable fossil fuel industry or suffer its effects in their communities. The alternative to unemployment, low pay and climate change is not fracking, but government investment in clean energy jobs. We encourage all workers to join an appropriate trade union www.tuc.org.uk/join-union If you are in a union, take our model motion to your union branch and local trades council. 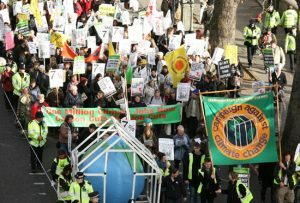 Join your local anti-fracking campaign. Join the Campaign Against Climate Change. action we need to prevent the catastrophic destabilisation of global climate. It’s time for a Just Transition in the UK, moving to a modern low carbon economy in such a way as to protect workers’ livelihoods, create new industries and deliver a fairer society in all regions and devolved nations. The need for action to support the UN’s Sustainable Development Goals and Paris Climate Change Agreement to keep global temperature rises to 1.5 degrees, is urgent if we are to avert the environmental and economic costs of climate change. We share a concern that the Government’s Industrial and Clean Growth strategies fail to reference the need for a Just Transition. This embodies the principles of consultation between all sections of society; investment in skills and jobs; the creation of decent work; and social protection for individuals and communities, particularly those reliant on fossil fuels. It is necessary to confront the danger facing our industries and power system as employment in traditional sectors declines. Workers, if losing their job in these sectors, should be able to retrain and redeploy to a new job on equivalent terms and conditions, covered by collective agreements, and fully supported in their housing and income needs through transition. Government must take a decisive lead with plans to transform key sectors, through publicly and community owned energy supply, transport infrastructure, investing in energy efficiency and sustainable heating in our homes and in industry. The speed and scale of Government action must be increased, as advised by the Committee on Climate Change. Where necessary to secure change at sufficient pace and scale, options for public and community ownership or partial stakes in flagship energy projects and enterprises should be pursued. Employment and social benefits for communities most affected by industrial change should be secured through local investment in new jobs and skills, the creation of local supply chains, and ‘community benefit’ clauses in public contracts and local ownership. The principles of social justice and equity must be adopted to ensure no-one is left behind in the transition to economic and environmental sustainability. Meanwhile, internationally, the government should support the strengthening of workers’ rights and environmental standards in the global supply chains for low carbon industries, such as solar panel and battery production. incorpo rate Just Transition principles within the UK’s commitments to implement the Paris Agreement, including the UK’s Industrial and Clean Growth strategies. legislate for the right to appoint workplace environment representatives to help ensure workers’ views are fairly represented at local level. At company and sector level unions need the right to a voice in the economic restructuring decisions that will take place. establish a Just Transition Commission to develop a shared understanding of the challenges and opportunities ahead, along the lines of the welcome initiative of the Scottish Government to establish such a body.